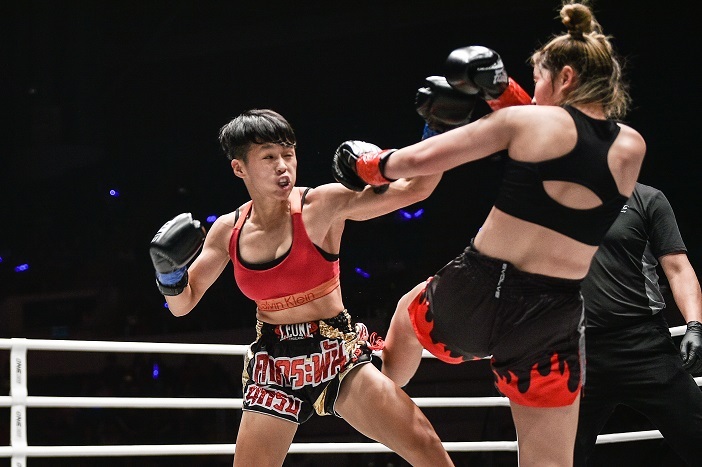 ONE Championship™ (ONE), made a triumphant return to Guangzhou(China) last Saturday night, as the biggest and brightest stars in martial arts came out to showcase their incredible skills. The Guangzhou Tianhe Gymnasium played host to ONE: BATTLE FOR THE HEAVENS and electrified the crowd with world-class martial arts action. In the main event, “Killer Bee” Kai Ting Chuang of Chinese Taipei captured the inaugural ONE Super Series Kickboxing Atomweight World Championship with a unanimous decision victory over Yodcherry Sityodtong of Thailand. In the co-main event of the evening, Filipino-Australian dynamo Reece “Lighting” McLaren made his case for a shot at the ONE Flyweight World Championship with resounding clarity, edging out Japanese veteran Tatsumitsu Wada by way of split decision. McLaren flaunted his fluid striking, repeatedly hammering Wada with stinging punches and lashing leg kicks. Although Wada posed problems on the mat in the opening moments of the bantamweight contest, McLaren’s impeccable grappling was able to pull out all the stops in the last two rounds of the bout, wearing out the Japanese stalwart with powerful takedowns and submission attempts. In the end, McLaren earned two of the three judges’ nods to have his hand raised by split decision.